Why Curriculum for the Bioregion? During a week-long field course on the health of Puget Sound, faculty from Seattle-area colleges and universities report out on during an environmental justice walking tour of South Park. Higher education must lead the way in preparing learners for citizenship in a world where the complex issues of sustainability—environmental quality, community health and wellbeing, and social equity and justice—are paramount. 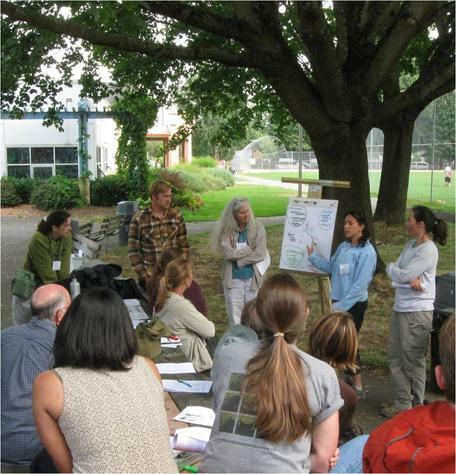 Curriculum for the Bioregion engages faculty communities in exploring these issues and in building sustainability concepts and place-based learning in a wide array of courses and disciplines. An initiative of the Washington Center for Improving the Quality of Undergraduate Education, Curriculum for the Bioregion serves colleges and universities throughout Washington State in the wider Cascadia bioregion as well. In this resource collection at the Science Education Resource Center are activities that incorporate sustainability concepts and place-based learning, introductory courses that feature sustainability themes, and essays on bioregional teaching and learning and the pedagogies of teaching for a sustainable future. Contribute an Essay exploring pedagogical issues related to sustainability education. Since the project's creation in 2005, Curriculum for the Bioregion has been supported by the following foundations and grants programs: The Russell Family Foundation; U.S. Department of Education's Fund for the Improvement of Post-Secondary Education; U.S. Environmental Protection Agency; The Norcliffe Foundation; and the Sustainable Path Foundation. Disclaimer: Any opinions, findings, conclusions, or recommendations expressed in this website are those of the author(s) and do not necessarily reflect the views of these foundations or grants programs.